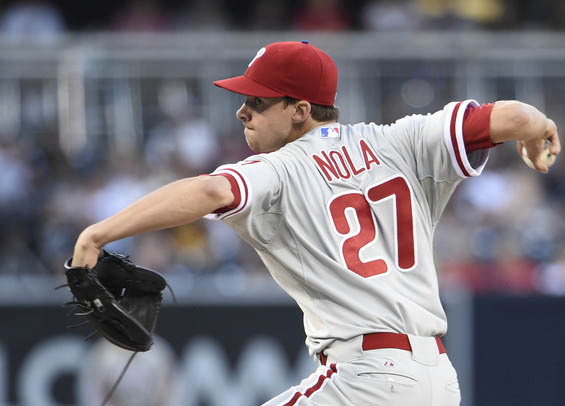 By default right now, Aaron Nola is the Phillies ace and likely to be the one on the mound come Opening Day when the curtain drops in Atlanta. The rotation after him though, for now at least, is littered with inexperience and question marks. General manager Matt Klentak has already upgraded the offense and reinforced the bullpen via free agency, but addressing the rotation is proving to be more difficult. The reality is Klentak's efforts may go nowhere. Ownership isn't keen on inking starters over 30 to long-term deals and the trade market isn't developing as some projected. It's not necessarily bad if youth is the play for the Phillies in the rotation, but it creates an unknown that could hinder things as the club strives to shed the skin of a rebuild. “If [acquiring another starter] happens, great. If it doesn’t happen, we’re excited about the young pitchers and giving them opportunities,” Klentak said. "That’s nothing any team can force. It will happen organically, and whenever an opportunity that presents itself that we think merits action, we will act." Nick Pivetta, 24, showed signs last year that he was major league ready but finished 8-10 with a 6.02 ERA. Ben Lively, 25, was 4-7 with a 4.26 ERA. Jerad Eickhoff, 27, and Vince Velasquez, 25, struggled last season and are coming off injuries. Zach Eflin, 23, has a 5.85 ERA over 22 carer major league starts and Mark Leiter Jr., 27, was shelled in September to the tune of a 7.71 ERA over his final five starts of the season. Plenty of youth, but plenty of question marks too. Spending $60 million on Carlos Santana indicates Klentak and Co. are ready to win now, but if the rotation doesn't improve on last year's lackluster showing (20th in opponents batting average, 21st in ERA, 19th in WHIP) then it's tough to see the team as competitive. It's a balancing act for sure, but that may be what the 2018 season is all about for the Phillies. The battle between assessing talent and learning to cut bait and move on. A laudable view, but a tough sell in Philadelphia.